“toddler” for the next 5+ years??? I adore my oldest son, Cody, but we’re only at the beginning of the toddler stage and it’s challenging! I don’t know if I can do this for a few extra years, or worst yet, forever. I worry about how different our lives are going to be. I like our life now. I don’t want it to change drastically. What will that do to Cody? Will I be able to give him even half the amount of attention he gets now? I want to focus my energy on getting my baby well (he has a suspected heart defect – an ultrasound will either confirm that suspicion or give us great news on July 3rd). How can I focus on one child without taking my focus off the other? I’m sure this is a concern of many moms facing the birth of their second child. And I know it’s normal and obvious that the first child will not get all the attention of the parents anymore. But our case is different than most. What if Eli needs to spend extended time in the NICU at birth? How do we spend time bonding with Eli and keep Cody feeling secure and comforted? We are a very attached family. He’s never spent the night away from us. He’s only been with a babysitter (his Nana or his Grandma) a few times for a few hours. Everyone says how unhealthy that is for all of us but we just like being together. Now I’m scared that he will feel abandoned when Eli arrives. I remember the overwhelming fear that hit me the night before my scheduled c-section with Cody. We were cuddling with our two dogs and I said to Chuck, “I don’t want our lives to change. I like it the way it is!”. I laugh thinking back to that night because our lives are so much better now! That next morning my heart exploded with love for my new baby. I have never experienced a love so great. I keep trying to remember that. I was fearful of change before Cody’s arrival. I’m fearful of the change that will occur with Eli’s arrival. Will it be different? Of course. But my heart has room for more love. I’ve heard it said that once you receive this diagnosis for your child you go through a mourning period, grieving the loss of the child you thought you were having. Sadly, I am all too familiar with grief. I know it goes through stages. I know it comes and goes. I will not beat up on myself for going backwards in my grief. I know tomorrow, or next week, or next month my feelings will once again be different. 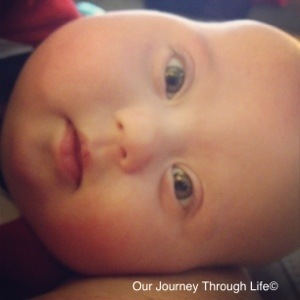 I am so thankful we received Eli’s diagnosis prenatally. Many people have to deal with this roller coaster of emotions all while trying to bond with and care for their baby when they find out at birth that their child has Down syndrome. I can only imagine how difficult that must be. So, I am grateful to be able to go through this now, when Eli is completely unaware. I pray that when he arrives my heart will once again be exploding with love and everything will truly be ok.